The year was 1987; the month was January. At the time, ATI President / C.E.O. Steve Leis was nearing his 20th year at Leis Motors, a Chrysler dealership established in 1925 by his grandfather Jacob. In recent weeks, Steve had been entertaining fantasies of a car wax that could be applied directly to the finish of a dirty vehicle without having to wash it first—and more importantly, without scratching its paint. By the time the 21st of the month rolled around, he was all set to go. Armed with a handful of maverick ingredients and a $10 kitchen blender, Steve began the unenviable task of developing a single product capable of both washing AND waxing a vehicle at the same time. Warehousing Wet Paint's 35 ingredients requires a lot of storage space. To his surprise, the 40-year old entrepreneur met with success on only his second attempt! Not expecting victory so early in the process, Steve’s glee quickly turned to gloom after realizing his failure to document the exact quantity of each ingredient used. The oversight proved ugly. By 3:00 AM (nearly three-dozen flops later), the motor on Steve’s el-cheapo blender was nearly as hot as the neck under his collar. The lesson learned that evening was as painful as it was challenging. CLOSE DOES NOT COUNT! In order for the formula to work at all, it had to be ‘right on the money’. A number of sleepless nights ensued as Steve stubbornly labored to resurrect the lost formula. Then, just as unexpectedly as it disappeared, the magic combination suddenly reappeared. Joy again reined in Mudville! Ironically, the temporary setback proved to be mostly beneficial because it demonstrated the formula’s intolerance for "deviation". Bad news for polish pirates; good news for Steve! In April of 1988, Steve waved goodbye to a lucrative career at Leis Motors, and together with his wife Leticia, founded Advanced Techniques, Inc. in the Industrial Park section of Elbow Lake, Minnesota. Less than two months later, at 2:00 PM on the 1st of June, the first bottle of Wet Paint came chugging down the assembly line to the cheers of staff & crew. From those humble beginnings, it took a few years to build up momentum, but by the end of the millenium, nearly 18 million bottles of Steve’s magic elixir had brightened the landscape. Literally. Not surprisingly, his revolutionary foresight helped open the door for a host of "me too" imitators. Fortunately, because Wet Paint is impossible to reverse-engineer, other manufacturers have had to develop their copycat formulas entirely from scratch. To date, none has come close. 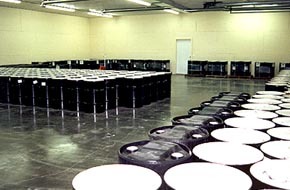 A portion of ATI's production facility. 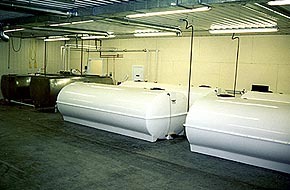 Each 3,000 gallon white tank houses bulk chemicals. The two 1,500 gallon stainless steel vats are for mixing Wet Paint and/or private labels. For one thing, ATI has exclusive rights to a number of complex chemical blends packaged by outside suppliers. Without access to these blends, cloning Wet Paint is a virtual impossibility. Then, too, a number of ingredients in Wet Paint have never been utilized by the car polish industry. This is somewhat akin to making toothpaste from a mixture of Jell-O and cornstarch. And finally, with roughly three dozen components in the mix, and a recipe so tight that even a 1% deviation on any one of them yields a vat full of mush…well, you get the idea. Oh, others keep trying, but their imposter products are nothing more than scented dust removers. There’s no real muscle to any of them. The Wet Paint formula, on the other hand is the real deal – a brew capable of rejuvenating dead paint, building deep three-dimensional shines, and protecting hard surfaces from Mother Nature’s disdain for shiny cars. And, to insure against the possibility of others catching up, Steve continues to tinker with his precious formula. He’s modified it (are you ready for this?) thirteen times now and we just can’t get him to stop. Of course, this might explain why Wet Paint remains a quantum leap ahead of Brands X, Y and Z. Despite achieving success against all odds, the folks at ATI have remained humble to their roots. They continue to maintain the same facility in Minnesota that they purchased in 1988, slowly expanding its size to a modest 10,303 square feet on 1.03 acres of land. Smallness of size, however, has never been much of a hindrance because they’ve learned the value of efficiency. For example, with the touch of a few buttons, 35 ingredients are sent spilling into 1500-gallon stainless steel mixing tanks; and with the touch of another button, the finished product is sent to its destination. Fact is, one individual can produce 7500 gallons of Wet Paint per day without breaking a sweat…admittedly with the air-conditioner set on HIGH. One area in which shortcuts are off-limits, however, is in the area of customer satisfaction. "Personal touch" is the predominant theme running through everything they do, from the hand-assembly of each 5-piece AIRosol bottle to the attention given customers over the phone. The vibrations at ATI are good and the atmosphere is one of family. We think this translates well when dealing with customers, both large and small alike. The "Commander-in-Chief," holding one of three electronic blending controllers. Over the years, ATI has also created nearly a dozen private labels for other companies and will continue to do so in the future. However, the spotlight will always remain tightly focused on Wet Paint—our flagship product—because it’s the one single product that no one should be without. Here’s something else. Despite the rising cost of raw materials, transportation, utilities and salaries, ATI has NEVER increased the price of Wet Paint. NOT ONCE! In fact, the cost to dealers was actually lowered by 20% in 1992 and has remained there ever since…a feat unheard of in modern times. Finally, while researching this piece, we ran across the following “ATI Business Creed”, which is something that was penned in March of 1987 and still holds true to this day. Perhaps even more so. Formulate the best product you know how, then make it even better. Produce and distribute the product yourself to keep end user costs as low as possible. Treat each customer as though they were your only customer. This is the attitude that’s helped keep ATI prosperous over the years despite the presence of industry giants who would like nothing better than to peck out the eyes of a weaker opponent. Our advice to them is to keep checking the rearview mirror. Wet Paint: The first of its kind / the best of its kind!